First Line: It is necessary to know this rifle. 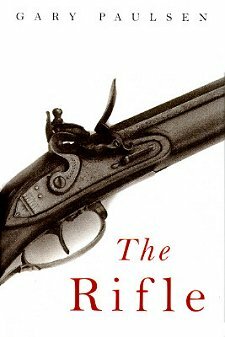 This short little book traces the history of one flintlock rifle from its creation during the American Revolution to the 1990s. The rifle's creation is a months-long labor of love by a journeyman gunsmith named Cornish McManus. When completed, it is most definitely a "sweet rifle" (meaning one of stunning beauty and accuracy). In desperate need of money, Cornish reluctantly sells the gun to John Byam, a sharpshooter in the Revolutionary War who dies of dysentery. The rifle, intended as a gift to a son killed in battle, is tucked away and forgotten as the centuries pass. In the 1990s it is found, and changes hands a few times until it rests above the mantel of a home in Missouri. Tragedy will ensue because-- during all this time and through all the hands it's passed-- no one has ever checked to see if the rifle is loaded. The first part of this book is wonderful. The craftsmanship that goes into the making of this rifle is phenomenal, and Paulsen brings the entire process to life. The rifle's "life" while in the hands of sharpshooter John Byam is also vivid and well done. But the book falls apart in the end. It's obvious that the author wants to teach children how deadly serious guns are, that no matter how beautiful they are or how innocently they are kept, guns are made to kill-- and they will kill. But it strains credulity to the breaking point to believe that a gun loaded in the 1770s will still fire first-time true in 1993. Middle school children may well take Paulsen's message to heart, and I hope they do, but for most of the adults who read along with their children, the aim of his story is going to fall short. Cathy - Thanks for the honest review. It's hard to strike the right balance when one uses a book as a teaching tool, especially for a lesson like this. It sounds like an interesting premise though. It is a very interesting premise, Margot. It is very difficult to maintain balance when you feel very deeply about any subject. I'm with you. No way would such a long time have passed without someone discovering the rifle was loaded. Besides the ammunition would probably be damaged and the rifle would be rusted so badly it wouldn't fire anyway. Nice try, but no go.